Jake Duncan loved reptiles. When he was a child, he didn’t want a dog or a cat for a pet. No, Jake would ask his parents every year for a pet alligator. Surprisingly, he never got one. Well, maybe it wasn’t such a surprise after all. Jake grew up studying reptiles throughout school. Even after school he would go home and where most kids would be playing outside or watching TV, Jake would sit in his room with a book and read about his favorite animals. Now, a man of 21, Jake was in college. He had enrolled for a bachelor of arts and science in the beginning, thinking he would pick a major later on in his college career when he found what suited him best. It was nearing the end of the school semester, and he had a project due in both his video media class, and his botany class. While talking with some of his friends at lunch one day, he was struck with an idea. Why not combine the projects into one? He decided to shoot an amateur version of “Croc hunter”. His friends Matt and Chris would help him shoot the video and they even planned on bringing Chris’s younger brother along with them, as a coffee boy. Jake wasn’t planning on actually getting close to any big animals though. He just wanted to get near enough that the camera could film them with a good close up. But he needed some place that would allow him to film them. There were several aquariums in town that he could go to, but it didn’t feel right to him. He wanted to show the animals in a more native environment, not some glass box. The answer literally hit him as he was leaving school one afternoon with Matt. As he got to his car, a small brown pamphlet was blown into his face. He blinked and pulled the paper off. As he read it he couldn’t help smile. The picture was of a sly looking alligator lying in what appeared to be a natural looking lake, advertising Circe’s Funhouse. Mark and Jake both decided that it would be worth asking if they could shoot the project there. Of course, Circe (disguised as a security guard) was only too happy to agree to let the boys do some filming in the bog. As they boys left to plan the filming, Circe smiled and walked to Saurina’s bog. Saurina sat on her favorite rock, enjoying the warmth of the sun along her scaly back. Curly was coiled up in a tree not too far from her. After all, if someone happened near them, he wanted to be close enough to have a chance at them before the big gator girl. They both turned their eyes to the sound of coming footsteps, and smiled a little as Circe came close to them. She held her hands out to each of them, and they in turn began to move towards her. “Saurina, Curly, my beautiful ones. I have a surprise for you”. The smile on her face was all too telling. Curly flicked his tongue in amused annoyance to Saurina. “Oh Pleassse Ssssaurina dear. You played with the lassst four people that were here. Do learn to sssshare onccce in a while?” Saurina’s tail swiped playfully at Curly, who was nimble enough to duck out of the way. Saurina and Curly looked at each other. Had their smiles been any wider, their heads would have fallen in half. They had a day to wait for the boys, and they used that time to plan what would happen when they entered the bog. Jake and his team met up for breakfast the next day. Chris and Jake had set out some filming guidelines for the project. Matt would be camera man while Chris would make sure the sound equipment would work. Jake would explain about the animals they taped. Chris’s brother, well, he was there to get coffee. He was only 12, so he was happy just to be involved. After all, his name would be in the credits. Once they had eaten, they headed over to the funhouse to begin the days filming. When they arrived and were admitted into the bog, they couldn’t help but stop and glance around a bit. It all seemed so real to them; the feel of the earth under their feet, the smell of the waters, even the buzzing of the occasional insect. Jake was thrilled with the location, and immediately began leading Mark along, looking for signs of wildlife. Chris stayed behind and began setting up some of the sound equipment, and sent his brother off to go find the first round of coffees. Chris worked away at setting up an amplifier completely unaware that a boa’s head bearing a sly smile was inching out of the grass behind him. With Saurina nowhere in sight, Curly hissed in delight, this one was all his. Chris stopped as he heard the hiss and slowly looked over his shoulder. He had been crouched on the ground while he worked, and thus made him almost eye level with the boa, which was only TOO happy to see him. “Greetingsssss. Welcome dear guessssst.” Curly’s eyes bore into Chris’s, entwining around his conciousness and making him more suceptable to the snake’s suggestive words. Chris swallows as he gazed back at the snake. He wasn’t sure what he was more afraid of. The fact that there was a huge boa constrictor looking at him, or that the same said snake just talked to him. He shivered and blinked, trying to clear his mind from the foggy sensation that had come over him. Curly maintained his lock on Chris’s eyes. “Oh but I did! I’m sssssoo glad to ssssssee you. It issssn’t often that we get visssitorsss here.” As he maintained eye contact, he inched forward a little, to run his head under the entranced boy’s hand. Chris swallowed at first, but then relaxed. Snakes didn’t scare him, though this one was definitely different than any other he had ever seen. He smiled as he ran his hand over the snakes head, as if petting it like a dog. Curly’s tongue flickered as he smiled. “Do you like the feel of my sssscalesss?” Chris nodded slowly, his mind becoming more and more clouded. The snake moved a little closer. “You’d probably like to feel them all over your body, wouldn’t you?” Chris swallowed again, but couldn’t find any reason in his mind to disagree with the snake. Again, he nodded absently. Curly backed up a little from him, “Well then, why not disssscard those unsightly garmentssss?” Chris was fully entranced by this point, and slowly removed his shirt, then began working on his belt. Curly almost bobbed in delight, his anticipation was at a fever pitch. After a few moments, much too long for Curly’s liking, Chris stood completely bare before him. With a sadistic smile on his maw, Curly slithered forward and began to entwine around Chris’s feet and ankles. Chris shivered but put up no resistance to the boa as it began to curl up his legs. The feeling of its scales sending little shivers up his spine. Coil by coil Curly moved up Chris’s body. His calves were enveloped, then his hips. Curly flicked his tongue at Chris’s stomach, causing the boy to shiver with a slight laugh. Further and further the snake coiled. “Mmm, handsssss at your sidessss.” Chris lowered his arms, letting the snake wrap around them, and take away his only means of defense should the entrancement be broken some how. Chris shivered as he was slowly enveloped in the snake’s coils. Curly was carefull not to squeeze too tight. Not yet anyways. At last he came to Chris’s head, and after giving him another glance in the eyes to make sure he was fully enraptured and a tickle in the ear with his flickering tongue, he completed his journey and wrapped around the boy. Chris shuddered in the snakes grasp, blissfully ignorant of any danger he might be in. Curly sighed contentedly; his victim was fully enveloped now. Now the fun could begin. He slowly began to tighten his coils around the boy, letting the magic of the bog begin to seep into his guest’s body. Chris gasped as his living prison began to close around him. He shivered at the sensation of the scaly skin getting tighter and tighter all around him. He began to wheeze slightly as his lungs were able to take in less and less air. Curly craned his head to look down at his captive, “Oh, I’m sssssorry.” With that he loosened his coil around Chris’s face, letting him catch a breath, only to close it tighter yet again in mid breath. Chris gasped and shuddered as an alien sensation began to come across his whole body, not realizing what was slowly beginning to happen. Curly slowly tightened his grip on Chris, squeezing his arms tightly to his chest, as if trying to push them right into his ribcage. Chris’s legs were pushed to tightly together that it felt like they might push together. Amazingly, that’s exactly what began to happen. As if his flesh and bone were nothing more than clay in an artist’s hand, His body began to reshape. His feet began to meld together, then his ankles, and then his knees. Surprisingly, Chris could feel what was going on. He felt no pain from the transformation, nor did he have much conscious thought to think about it. All he could think of at the time was his lungs, desperate for air. Curly hissed as he felt the boy begin to change, and rewarded him with a moment to breathe, only to tighten back up even tighter than before, causing the bone in his face to slowly soften, and change shape. Chris’s body continued to be pushed together. And for a moment, he opened his eyes wide as a new sensation began to come over him. Below his legs, he could no longer feel scale on flesh, but now, it was scale on scale. As his hips were slowly crushed together, he could feel his skin giving way to a row of scales that pushed out through his skin. He then realized what was happening. But oddly, he didn’t fight it. His mind began to cast vivid images of what it would feel like to be a snake, and he began to smile slowly. Curly seemed surprised by the boy’s lack of struggle at all and looked down into his coils. He was delighted to see him smiling as he changed. Curly hissed loudly and squeezed with all his might, wanting to reward Chris for being such a compliant “guest”. Chris gasped as he felt the coils crush him harder, and faster. Slowly his stomach and chest were changed, and he found it a little easier to breathe now, even though there was still very little room within Curly’s coils. The changes spread further up his neck and then the base of his head. He couldn’t see exactly what he was turning into, but he had a pretty good idea it was a snake of some kind. Curly hissed delightedly as he pressed his body tighter and tighter to the boys head, reforming it. Chris let out a wheezing cough as his face was reformed and the scales began to push through. His eyes squeezed shut, and when he opened them again, they were a pale yellow, and slited. Curly began to ease the pressure on his coils as Circe slipped out from behind a tree. The Boa smiled to her. “Yesss, Missstress.” With that, he began to uncoil, revealing a long, emerald tree boa where a human once stood. Chris coiled up on the ground as he was released. Circe smiled wide and reached down, picking the new boa up in her hands. Jake and Mark had traveled through the underbrush for quite some time now. Jake was ecstatic by all the exotic creatures they had encountered. After 30 minutes or so, they began to wonder where Chris was. His equipment shouldn’t be taking this long to set up. They doubled back and began retracing their footsteps. But the bogs smell had made the boys slightly light headed, and soon they found themselves lost. Saurina and Curly had plenty of time for the ambush, and set up so carefully that even a trained hunter couldn’t see them until it was too late. Jake was just about to speak when Saurina’s tail lashed out through the grass, tripping him and sending him tumbling down to the banks of her lake. Mark turned in surprise at Jakes stumble, but as he turned, Curly lowered his head from a branch directly over the boy. Mark’s eyes widened in surprise, and he found himself staring into the boa’s eyes, feeling himself silently falling under Curly’s spell. Mark shivered softly as his mouth slid open to speak, or cry for help, but all that came from his mouth was a long, thick, pink forked tongue. Curly had decided not to play with this one, and went straight for the transformation. Marks skin began to darken to a brownish green colour, mottled with spots of dark yellow here and there. Jake stood up from his tumble and blinked as he saw his friend changing. He took a step towards him, but then froze in place as he heard a sultry voice speak to him from the tall grass in front of him. “No no sugar. You’re going the wrong way. You let Curly have his fun. You can come play with me” The gator pushed the grass aside and let Jake see her as she crept closer. Jake found himself in complete awe, and then rapt with fear. He began to back up, slowly backing towards the bog. Saurina smiled and continued to herd him towards the magic waters. Mark meanwhile was being pushed through his transformation at a much quicker rate than Chris had. Curly wanted to watch Saurina have her fun with Jake. Mark shivered as he felt his skull elongate and push upwards at a ninety degree angle. His nose pushed forward, creating a snout, but his mouth remained where it began, and simply widened to fit the new face. His Body actually began to grow and thicken as his hide began to toughen up. Marks pants were soon ripped open by the force of a tail which had been kept within the denim confines up until now. Extra layers of hide began to form around his appendages, giving the arms and leg joints an almost webbed look. With a sickening crack his fingers spasmed, and unleashed brutal looking claws. So long and thick they looked as if they could rend steel. Mark, or the creature that used to be Mark, swayed a little and fell forward to the ground as his spine cracked and readjusted for four legged travel. The Komodo dragon was silent and still for a moment as his new instincts took over and he stalked slowly away, leaving the tatters of his clothing, and former life behind him in the grass. Jake’s eyes were as large as saucers. He’d just witnessed his friend transformed, and now could hazard a guess at what had happened to Chris. But that was only secondary to his mind. He had to worry about the approaching gator at the moment. Saurina loved this part of the game. Knowing her prey realized that they have no where to go, no where to hide, and they can do nothing but accept transformation. “Aww, come on now sugar. Did it really look that bad? I think your friends are much happier now. Why don’t ya come with me for a… swim?” With that, she lunged forward. Jake yelped and tried to run, but his first step put him ankle deep in water. As his foot buried into the soft mud, his balance was thrown off and he tumbled head long into the murky water. Saurina sighed happily and slipped into the water near silently. Jake pulled his head above the water and took a deep breath, then slowly looked around and realized the gator was no where to be seen. He pulled his foot free, losing his shoe in the process. He took a moment to try and relax, maybe the gator had left. He felt his heart skip a beat as he felt something slip between his legs and along the underside of his belly. He looked down into the water just as Saurina’s eyes pierced the surface. Her claws gently griped his sides and legs as she pulled up to him, letting him float with her attached. “Aww Sugar, don’t you see?” She pulled his head closer and whispered softly, in a sultry tone “Ya already are one, ya always have been. Ya just can’t see it because of all this pasty skin that’s covering your true self. Let me just rub it away so you can see for yourself”. With that, her front claws began to run down his sides, slowly ripping holes in the fabric of his shirt. ‘Oh well’ she thought ‘he wont need these stupid garments soon anyways’. Jake swallowed and closed his eyes, hoping this was all a dream. He found himself less and less afraid of the gator's affections, and soon, he even found pleasure in her caress. Jake opened his eyes and looked down at where Saurina had been touching him. His heart froze and he gasped. A line of deep green rough scales had appeared where flesh once was. She ran her claw over the scales again, sending a shock of electricity up Jakes spine. He closed his eyes and shivered. Thoughts of his life until now flashed before his eyes, as if weighing options in his mind. He slowly opened his eyes and looked down to her. His hands gripped at her gently and he tried to speak, but she ran her muzzle against his face and shook her head. Jake swallowed, and slowly shook his head. At this point he was feeling things he had never felt before, and wanted to feel more. And he knew the only way he would ever be able to hold onto these feelings is if he joined Saurina permanently. The gator let out a happy rumble and slurped him again. “Oh you’re gonna make a fine gator hun. Now lay back and relax, let Saurina work her magic. You’re gonna –love- this!” With that, she began to tear at his clothing with her claws and teeth, baring the boy to her touch. Jake shivered, knowing this would be the last time clothing ever touched his body. Once he was free, she began to rub him again, causing more and more of his skin to give way to the thick scaly hide that was slowly covering him. He felt his arms and legs beginning to shorten, and slowly a tail began to swim out behind him. The transformation seemed to slow down for a moment as Saurina gazed at the new addition to her bog, and Jake began to wonder why things were slowing, when suddenly, ‘SMACK’. Saurina’s tail connected with Jake’s, sending a charge through his body like he’d never felt before. ‘SMACK…SMACK’ Jake threw his head back as the euphoric sensations sent the transformation into overdrive. His hair began to fall out in clumps as his face began to stretch. Saurina herself was feeling highly charged. This was her favorite part, the moments before a guest was completely gatorized. She watched as the last remnants of his face and former identity were pushed aside for denser scales. Jake took one last breath as a quasi human, before Saurina lashed tails with him three times. He let out a roar as his muzzle completed form, and his eyes changed. Saurina savagely bit into his neck, letting Jake feel his new instincts wash away all that was human in him. She slipped out from under him and guided him to a circle of rocks where he could lie to rest for a while. After all, being transformed was a tiring experience. Once he had crawled atop a rock and fallen asleep, Saurina made her way back to where she had found him. Curly was lying in the tall grass by the bank as Saurina approached. The friends looked to each other and smiled wickedly, silently congratulating each other on a job well done. They both were startled to hear clapping not far off and turned sharply to see Circe, sitting in a director’s chair, wearing a beret, and Mark’s movie camera in her lap. Beside her was something covered in a black plastic tarp. She clapped and whistled in appreciation. Saurina and Curly both moved forward a little and bowed as if taking a curtain call. 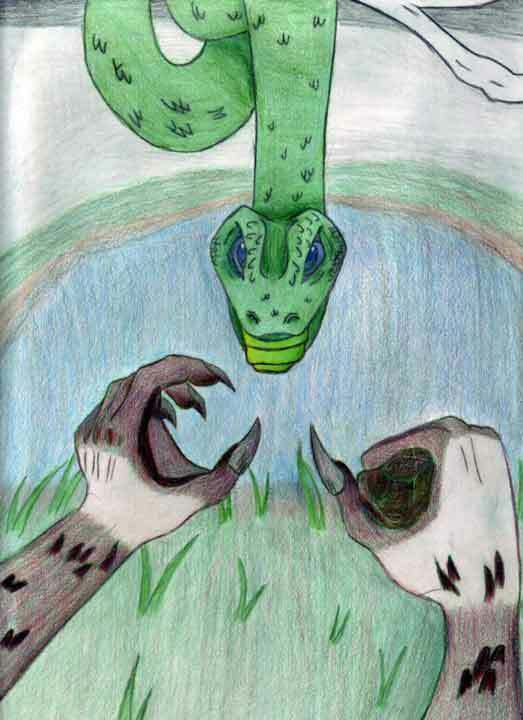 Oscar blinked and looked up at Circe with wide, scared eyes, and then over at the snake and gator, swallowing. Saurina and Curly both began moving forward, their playfulness having returned at the site of the new guest.